Santa Barbara Highlands! This spacious 2bed/1.5bath Mesa condo is approx. 1,120 sq. ft. and borders the gorgeous Honda Valley Preserve. Enjoy sweeping views of the wooded canyon from the downstairs and ocean views from the upstairs master. This lovely home features new interior paint, newer flooring, crown moulding, and recessed lighting. 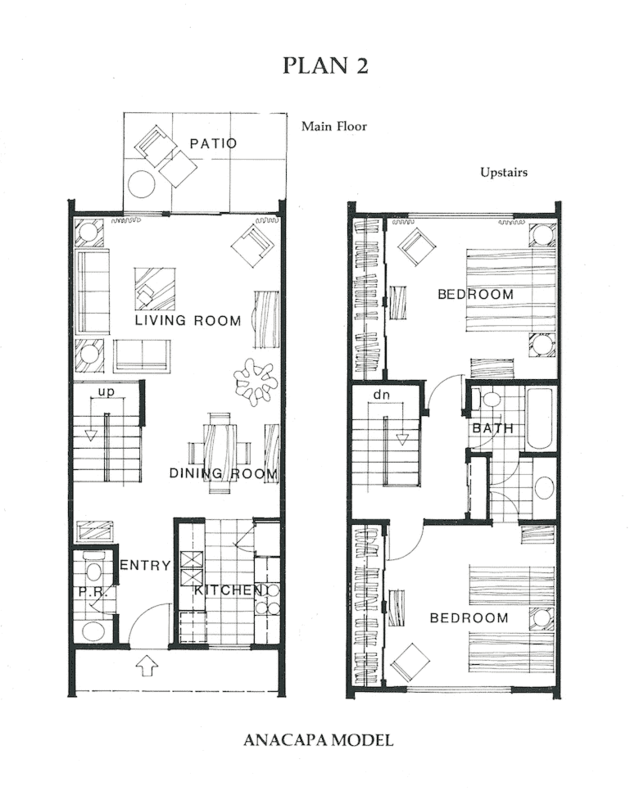 The downstairs consists of the living room, dining area, kitchen, half bath, and large open patio. The updated kitchen has new countertops and ample cabinet space. The contemporary glass stairwell leads to the upstairs bedrooms which feature vaulted ceilings and mirrored closet doors. This HOA is centrally located on an 18 acre private hilltop between the Mesa and Downtown Santa Barbara. The Highlands residents enjoy 2 pools, a spa, common area, clubhouse, and security. The pictures are stunning, but nothing compares to seeing it in person! Santa Barbara Highlands! This spacious 2bed/1.5bath Mesa condo is approx. 1,120 sq. ft. and borders the gorgeous Honda Valley Preserve. Enjoy sweeping views of the wooded canyon from the downstairs and ocean views from the upstairs master. This lovely home features new interior paint, newer flooring, crown moulding, and recessed lighting. The downstairs consists of the living room, dining area, kitchen, half bath, and large open patio. The updated kitchen has new countertops and ample cabinet space. The contemporary glass stairwell leads to the upstairs bedrooms which feature vaulted ceilings and mirrored closet doors. This HOA is centrally located on an 18 acre private hilltop between the Mesa and Downtown Santa Barbara. The Highlands residents enjoy 2 pools, a spa, common area, clubhouse, and security. The pictures are stunning, but nothing compares to seeing it in person! 953 Miramonte Drive #7, Santa Barbara, CA from Mike Richardson, Realtors on Vimeo. The Mesa from Mike Richardson, Realtors on Vimeo. House Size: ~1,120 sq. ft.